She's not too fond of scales. Except the kind that are on her midday meal of fish. 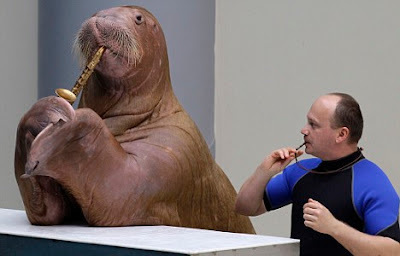 But Sara the walrus still does her music practice every day, under the watchful eye of her Russian trainer Sergiy. Gripping the instrument firmly between her flippers, she blasts out a note loud enough to make her whiskers vibrate. The musical mammal has become the main attraction at her home, the newly-opened Istanbul Dolphinarium. 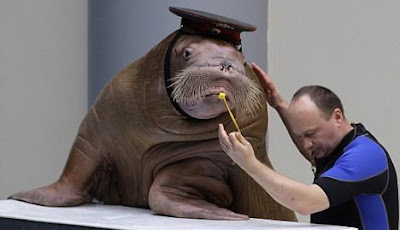 Sara is particularly clever, as walruses go. 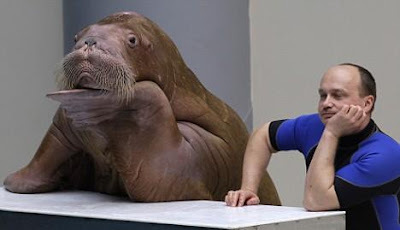 She can strike a nonchalant pose, leaning on a worktop looking bored, with one flipper under her chin. Her skills at mimicking humans extend to dressing up as a railway conductor and blowing a whistle. She can lie down and catch a rose when it is thrown to her. And she has become adept at games with balls and hoops. She certainly has a much more exciting life than she would in the wild, where walruses spend most of their lives lying on sea ice and seeking out molluscs to eat. They live for around 50 years in the wild.